Need somewhere to bolt your new winch or maybe your high lift jack? Sounds like upgraded bumpers are in your future! ARB, Body Armor, Fab Fours, Road Armor, Warn, Herd, n-Fab, Paramount Offroad, Smittybilt, and Trail FX are available through us in a huge array of fitments and designs. 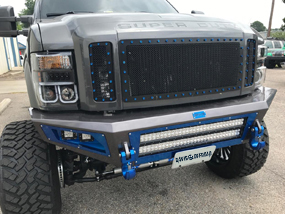 Aftermarket bumpers are not only completely functional; they will also push your truck over the edge if you are going for that “Aggressive” stance. Keep in mind these bigger bumpers normally weigh more than stock units and in some cases will take additional lift to compensate for that. Davis Offroad is on-hand to help you choose your new bumper, and to offer advice on additional parts such as winches, lights, spare tire carriers, and hi- lift jacks. Can’t find a bumper that suits you? Ask us about custom fabrication to get one tailored to your standards.